Writer and illustrator, Lizzy Rockwell, has whipped up a delicious kid’s guide to proper nutrition and healthy eating which is just plain “Good Enough to Eat.” Packed full of colorful illustrations, facts, experiments, and recipes, Rockwell does an outstanding job of linking the basic principles of proper nutrition directly to the human body. Designed to satisfy a child’s curiosity about their body and how it works, Good Enough to Eat presents basic nutrition facts in a kid friendly, easy to understand format which is perfect for reading at home or school. An appetizing blend of factual information, recipes, and fun hands-on experiments, Good Enough to Eat satisfies a child’s hunger to learn about proper nutrition with bright lively illustrations, informational speech bubbles and text, and a diverse group of children who navigate their way through the complexity of anatomy and physiology to learn the relevance behind the food pyramid and how it applies to their bodies. The inside covers of the book are adorned with meticulous illustrations of the five food groups and the proper serving sizes for each. With every turn of the page, children will learn more information about the foods they eat.  What is the digestive system and how does it work?  What is the food pyramid and why is it important to follow it?  What vitamins, minerals, and nutrients do certain foods contain?  How are these nutrients broken down in the body?  What important role do each of the food groups play?  Why is drinking water so vital to maintaining a healthy body? Rockwell saves the best for last, delicious recipes using some of the nutritious foods showcased in the book. This educational and entertaining picture book help will help children understand the important role each of the five food groups play in achieving optimal health and well being. 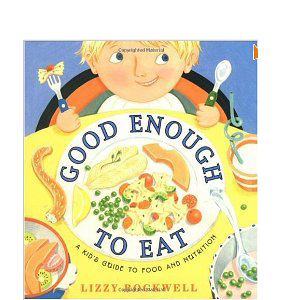 If you are looking for a cross-curricular guide that links proper nutrition with its effects on the human body, Good Enough to Eat is an excellent springboard for any unit and is the perfect resource for any teacher or parent who wants to teach their child about proper health and nutrition.